Anthony Skorochod of www.cyclingcaptured.com posted a bunch of great photos from the Mengoni Grand Prix. I've done enough races in the rain to guess what happened. I recognize those expressions of pain. It looks like lots of road rash and broken bikes, but I think everybody walked away. 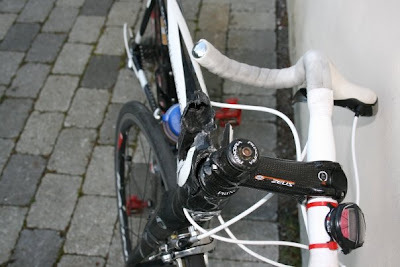 Don sent me these photos of his Zipp 404. 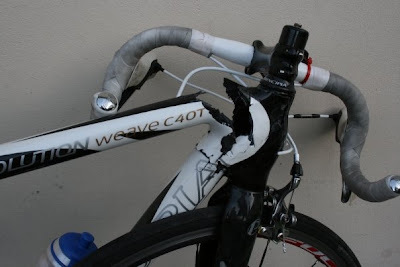 The was pushed into the barriers during a crit, breaking 7 bones and his Zipp 404. 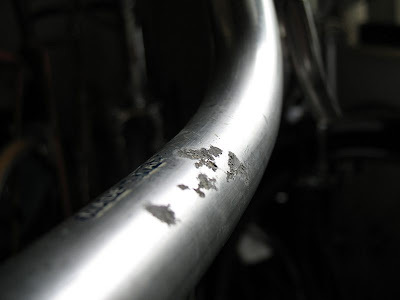 His steal steel frame and Alpha fork were ok. 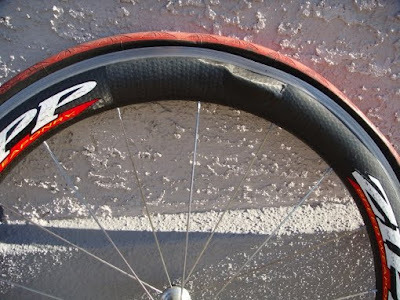 Somehow Zipp managed to rebuild the wheel. Hopefully Don won't be off the bike for too long. 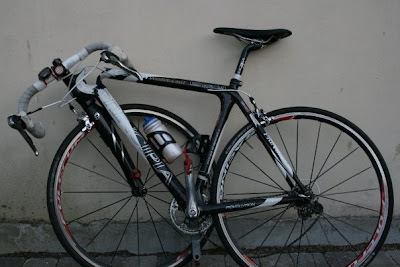 Carlos sent in these photos of a bike his girlfriend bought on eBay. The seller claimed he knew how to ship a bike. eBay, you will never find a more wretched hive of scum and villainy. I received these photos of a Principa Revolution with no details of what happened. It's not a brand I am familiar with, but it looked like it was a nice bike. I wish I had some details, but the damage does look like crash damage. 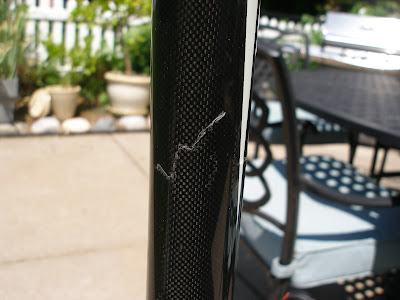 Jamie sent me these photos of his 18 month old carbon seatpost that snapped. 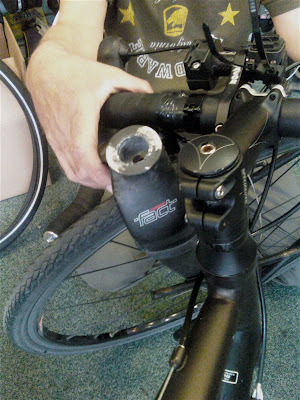 Since today is supposed to be a No Carbon Wednesday, I'll also include a photo of his broken front derailleur. 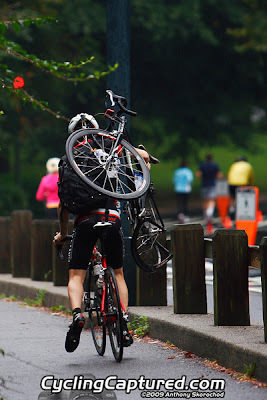 As seen on Bike Snob NYC, it's not always the carbon fiber that fails; sometimes it's common sense. These are probably the world's most expensive chopped handlebars. Greg sent in these photos of a friend's Giant XTC. No word on what he did to it. These carbon XC frames seem disposable without the disposable price. 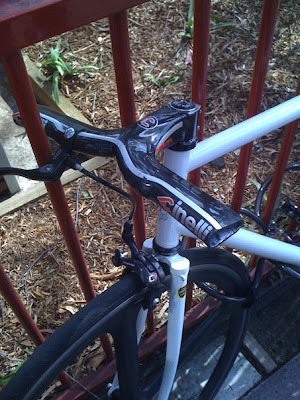 I was sent this photo of a Jamis Nova that was crashed into a curb. 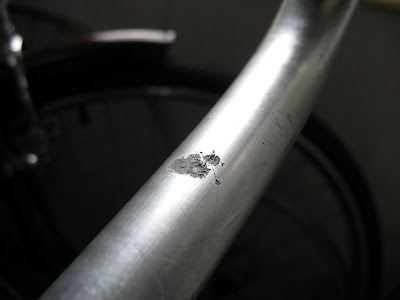 The carbon fork survived, the steel frame didn't. My friend Jen did the same thing with a similar result. 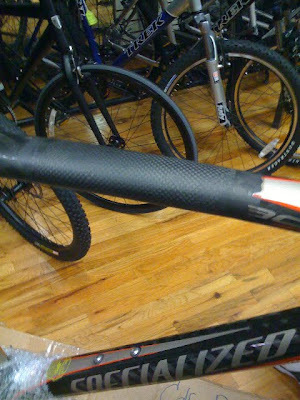 Chris Sugai, co-owner of Niner bikes, is trying to dispel some of the myths about carbon fiber. I'm not exactly sure what this video proves, but the fork does look pretty tough. 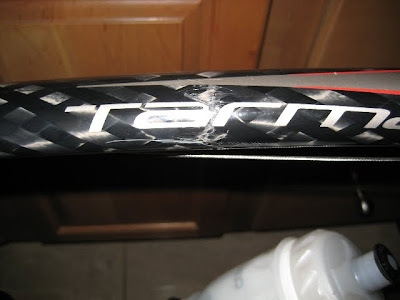 Kyle sent me these photos of his Specialized mountain bike that he rode into a tree at 25mph during a race. 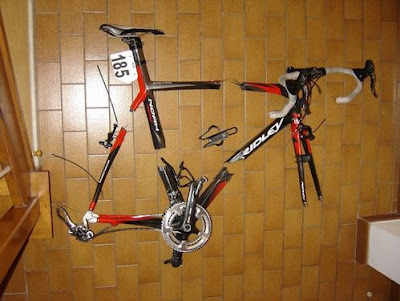 Paul sent me these before & after pictures of his Specialized Tarmac. He didn't give many details, but it looks like he had his top tube repaired. I would have preferred a new frame. Another submission from Anthony. 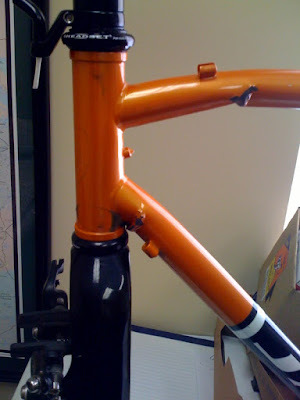 This one is surprising because the Tri-Cross forks look a lot stronger than most cyclocross forks. I guess look sstrong isn't the same as is strong. The poor guy who owns this Specialized Tri-Cross bike was descending a hill at speed when the fork suddenly snapped clean off at the crown! The guy was wearing a helmet luckily but told me that sometimes he doesn't bother! I reckon even as it was he is lucky to be alive! The bike in question was only six months old and had not been used off-road - in the way that the cyclo-cross style marketing of this model hints at. Only knows how long it might have lasted if it had been used off-road!!!! The guy took it straight to his dealer after talking to me and later commented that they'd taken it off him pretty quick! 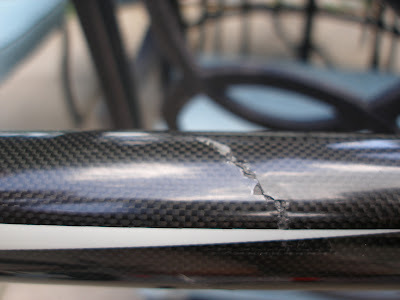 As an experienced mechanic I can honestly say that this is the scariest failure of a carbon fork to date! 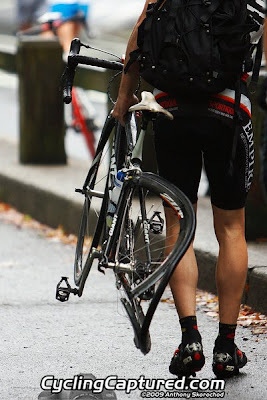 In sept of 2008 I was out for a ride in Seattle on the bike trail near the UW campus. 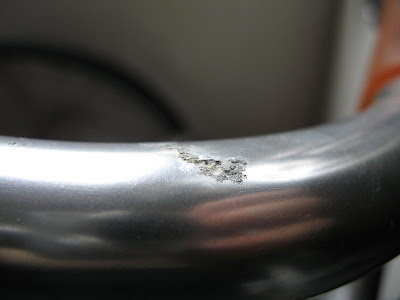 I was riding eastbound through an intersection and was t-boned on the right by a northbound subaru (thank goodness it was a low profile vehicle). 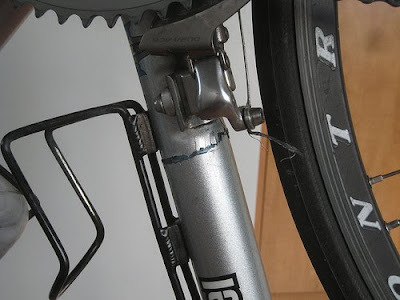 It hit my right pedal and bent the dura ace crank past the right chain stay. 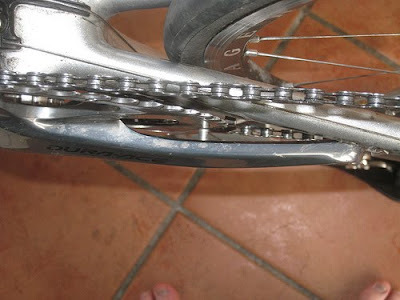 The left chain stay was broken as well as the seat tube. I was flipped onto the hood and the bike was punched out into the intersection. 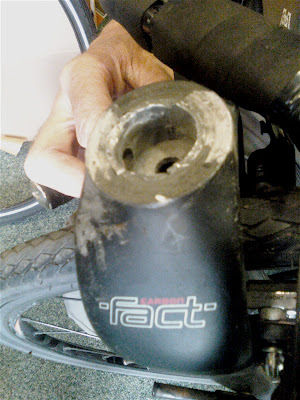 I also cracked my giro pneumo helmet but not my head. Aside from a few nice bruises and scrapes on my legs and some sore back muscles, I walked away from the crash. Wow, he's very lucky to walk away from a crash like that. Joshua sent this one in. 3 months old. Fell over. Toast. 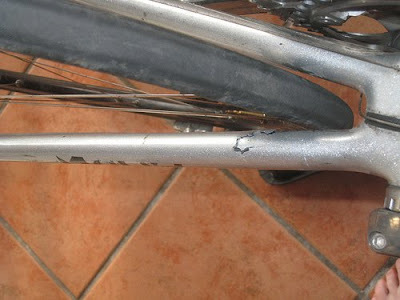 It's not unexpected for a frame to break when it gets crashed into a concrete block at 40+ km/h, but when it just tips over and breaks, I think that hurts the most. 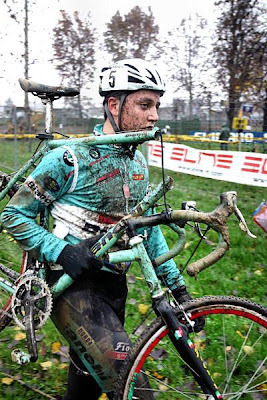 Cyclocross season starts soon. 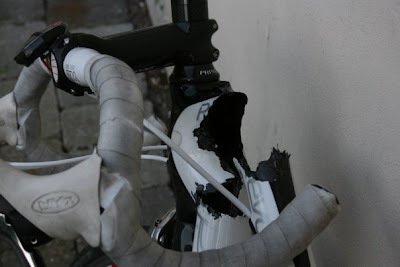 Don't forget to take your camera to the races and then send me photos of the carbon (and non carbon) carnage. Follow Busted Carbon on Twitter! Never miss an update.